Q: Can I store appliances in my storage unit? A: A refrigerator or freezer should be thoroughly dry and stored with its door slightly ajar. Some goods can be stored inside large appliances and boxes can be stacked on top of stoves, refrigerators and freezers. Make sure that stove and cooking equipment are cleaned before they are stored. Q: How should books and documents be stored? A: Pack books flat to protect their spines. Do not place boxes directly on concrete floors, but use pallets or skids to prevent moisture. Use packing to fill out empty pockets in the boxes. Do not pack fragile items in the same box with books and do not overload. Q: Is there any particular way to arrange my things in my storage space? A: Pack the storage space carefully. Leave air space around the perimeter to aid ventilation. Place a pallet on concrete floors and do not lean items against walls. Leave a walkway to the rear of your space for easy access. Use all the space available, including the height, and place frequently used goods near the door. Q: What items should not be placed into storage? A: Do not store food or other perishable items which could decay or attract insects or rodents. Also, do not store flammable or toxic items in your unit. No paints or solvents. Q: What other things should I be aware of when storing and utilizing my storage space? Q: What's the best way to pack up boxes and containers to place into storage? A: Fill containers to capacity. Partially full or bulging cartons may tip or collapse. Heavy items like books or tools should be packed in small boxes so they are easy to lift. Protect your fragile goods with packing (i.e. , bubble pack or other) and place them near the top of your storage space. Label boxes. Take home a list of your labeled boxes for easy reference when you need to locate your goods. Monday - Friday: 8:00 a.m. - 5:00 p.m.
Saturday: 10:00 a.m. - 4:00 p.m.
7 days a week: 6:00 a.m. - 8:00 p.m. Call to reserve your space now. 1425 W. Forest Meadows St. 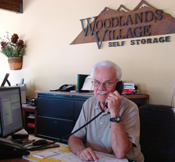 Copyright © 2007 - 2019, Woodlands Village Self Storage. All rights reserved.